Why do we pay taxes when the United States didn’t even have an income tax before 1913? Why do we pay taxes for property we already paid for every year? Why do we pay taxes to both the federal government and the state government? Why do we pay taxes when billionaires aren’t paying their fair share? These are questions that I have been asked in regards to taxation and I thought I would weigh my 2 cents in on the issue as well as provide some research to help us along. I personally don’t like paying taxes (like most people) and I try to optimize my taxes to pay the least amount possible. It does help ease the pain a bit when you take a look at what that money is actually being used for. The short answer? Because if we don’t they will garnish our paychecks, put a lien on our house, and throw us in jail if we fail to file our tax returns. Okay so the long answer is more complicated. In 1913 a constitutional amendment was passed allowing congress to levy an income tax. Prior to that our Federal government was much smaller than it is today and was mostly funded through tariffs. Originally the income tax was only levied on people who were high income earners, it didn’t affect the common worker. There was a 1% income tax on income over $3,000 ($76,360 in 2018 dollars) and it was a graduated tax that maxed out at a 6% tax on income over $500,000 ($12.7 Million in 2018 dollars). Slowly but surely the tax grew with big spikes to finance World War 1 and World War 2, and 100+ years later most Americans work a third of the year just to pay their federal income taxes. 47% of federal revenue comes from the federal income tax, 34% comes from payroll taxes (Social Security and Medicare), 9% from the corporate income tax and 9% from excise and estate taxes. So where does this money go? Our Federal Government is spending $4.4 Trillion in fiscal year 2019. These four programs are considered non-discretionary spending, meaning congress doesn’t have a choice but to pay for them. These are the biggest ticket items in the federal budget and without reform will cause our country to continue to go further into debt. Social Security covers living expenses for current retirees based on their earnings record and what they paid in, as well as survivor insurance for children with deceased parents, disability insurance for those who can’t work, and Supplemental Security Insurance for those with medical barriers to full time work. Medicare covers medical costs for people over age 65 and Medicaid is a program that covers medical costs for children and adults who are very low income. The interest on the national debt is the last non-discretionary expenses. We have to pay interest on the money we have borrowed so far. In total Non Discretionary spending is over $2.4 Trillion dollars. Interest on The National Debt: $363 Billion: Our nation is in an insane amount of debt. Our debt is now over $21 Trillion dollars. That’s 21,000 Billions for those keeping track. We have to pay interest on this debt just like you and I have to pay interest on our mortgages or our car loans. The problem is that our national debt is more like credit card debt. We borrow money every year to cover our living expenses, not to fund major investments. For example, we are almost a decade into a bull market and have the lowest unemployment in over 4 decades, but we are still spending almost a trillion dollars more this year than what we are bringing in. Military Spending: $686 Billion We as a country feel a need to not only be the policeman of the world, but also to spend more on “defense” than the next 9 countries combined, despite the fact that most of those countries are our allies. We aren’t going to be invaded by the Russians if we spend $300 Billion a year instead of $700 Billion a year. We also spend a lot of money on expenses that are directly part of our military spending. In reality the Department of Veterans Affairs, the State Department, the Department of Homeland Security, and the NSA at a minimum should be included in our defense spending. This brings our total up from $686 Billion to around $890 Billion. This puts us at spending more than the next 38 countries combined, or roughly 52% of all the military spending in the world. Why Do We Pay Taxes For Social Security and Medicare Separately? If you take a look at your paycheck you will see that both Social Security and Medicare are taxed separately from your Federal Income Tax. Originally these programs were meant to be self sustaining without having to use general fund money to support them. Over the years congress has borrowed stolen from the Social Security trust fund while it was running large surpluses, you know before all the baby boomers started retiring. When Social Security was first started in 1935 it was designed to be a small supplement to keep the elderly from starving in the streets. To qualify, workers had to be 65 years of age and at the time the average life expectancy was 61 years, today it is 78.6 years. If Social Security were passed today, the age limit may well be 83! This separation of taxation also feeds into the myth that we are paying into our own retirement benefits with Social Security. This is not the case. Sure, they keep a ledger of what you have contributed and use it towards calculating your future benefits, however the money you pay in is not earmarked or set aside for you, it is being used to directly fund current retirees today. By 2034 Social Security will only be bringing in 75% of what it is supposed to be paying out. Social Security is the primary source of income in retirement for many people and is also an important program for providing disability and survivor benefits. Why Do We Pay Taxes To The State Government? State governments provide a lot of services that are not provided by the federal government. The two largest costs in most state budgets are health care and education. Many states do not levy an income tax, such as Florida, Alaska, Nevada, South Dakota, Texas, Washington, and Wyoming. These states generally levy a larger sales tax in order to make up the budget difference. Using my home state of Michigan as an example, the 2019 budget is $56.8 Billion with almost 75% of the budget being spent on health and human services and education. The Michigan state budget is primarily funded with a 4.25% income tax and a 6% state sales tax. $25.2 Billion: Department of Health and Human Services: 60% of this funding is for Medicaid, 14% Behavioral Health Services, 10% Public Assistance, 6% Children’s Services, 5% Administration and Operations, and 4% Public health. $14.5 Billion: School Aid: 73% goes directly to district schools for general operations, 10% to School Retirement System, 8% to Special Education, 3% to At Risk Students, and 2% to Early Childhood Education. $4.7 Billion: Department of Transportation: 42% Local Road and Bridge Construction, 39% State Roads and Bridge Programs, 9% Transit and Rail, 5% Debt Service, 3% Support Services, 2% Aeronautics Services. $2 Billion: Department of Corrections: 59% Prison Operations, 19% Parole, Probation, and community Service, 15% Prisoner Health Care, 7% Administration. $1.7 Billion: Higher Education: 82% University Operations, 7.5% Student Financial Aid, 3.5% MSU AgBio Research and Extension. $1.4 Billion: Department of Technology, Management, and Budget: 49% Technology Services, 27% Management and Budget, 19% State Building Authority Rent, 5% Civil Service Commission. $1.1 Billion: Department of Talent and Economic Development: 42% Workforce Development Programs, 20% Michigan Housing Development Authority and Land Bank Authority, 14% Unemployment Insurance Agency, 10% Business Attraction and Community Revitalization, 14% other. $6.2 Billion: All other programs. This includes funding the executive, legislative, and judicial branches of state government, the state police force, licensing and regulatory affairs, natural resources, veterans affairs, agriculture, environmental quality, community colleges, and a few other programs. Property taxes are the primary source of funding for local governments. These taxes primarily go to K-12 education, roads and city infrastructure like sewer and water pipes. These taxes support local police forces, libraries, and parks. In most areas if you don’t pay your property taxes for a few years the county will seize your property and sell it at a tax auction. This ensures that the county receives the revenue it needs and that derelict properties are either demolished or put in the hands of owners who will care for them. In Berrien County, MI the tax foreclosure process has been used to tear town hundreds of abandoned and blighted homes. Property taxes can vary substantially by state and even by county and township. Below is a breakdown of the property tax rates in my county, the lowest rate is less than half of the highest rate! From my property tax bills here are the heavy hitters. Note that property owners who do not have a homestead exemption pay an extra 18 mills on their summer property taxes for local schools. Other categories below 5% are: Legislative, Recreational, Economic Development, and Public works. Why Do We Pay Taxes To The City? City income taxes are paid because your elected officials are crooks. Ok, so that may be my personal opinion, but that is why you are here! Generally city income taxes are passed to cover infrastructure repairs and improvements. Infrastructure is a non partisan issue and people are more willing to be taxed for roads, water, and sewer services. Benton Harbor, MI recently passed an income tax that is designed to solely fund road repair work in the city. I’ve been asked this question, or one similar to it so many times it is scary. The idea is that that super wealthy should cover all of the funding of the federal government. Well, for the most part, they do! The top 1% of income earners pay 37.8% of all federal income taxes (on 19% of Adjusted Gross Income). The top 10% pay 69.8% of federal income taxes on 45.8% of AGI. So both as a percent of the population and as a percent of total income, the wealthy pay more in taxes than the rest of us. Now just to play with the numbers, the total wealth of all Billionaires in the WORLD is $9.2 Trillion. Seizing every single penny that every Billionaire in the world has would only fund our government for 2 years. You simply can’t have a government like ours without the majority of the citizens paying in. Did you find this breakdown helpful? I had a lot of fun researching this one. I find that many people think their taxes are going towards things they don’t support, yet for all of the actual large items that our tax dollars go to, they do support them. It is alarming that our national debt is growing at the rate it is. When one party continually claims to be fiscally conservative, yet every time they are in office they consistently run higher and higher deficits it is extremely disappointing. Regardless of your political leanings, I think the majority of Americans will agree that you need to pay for what you are consuming. Any surprises in the breakdown of where our taxes actually go? 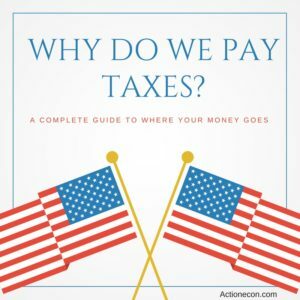 One Response to "Why Do We Pay Taxes? A Complete Guide"
It is good to know that even the filthy rich people pay taxes since I thought that they were exempted. The growth of our country’s debt is alarming and this shows that we might end up paying even higher taxes in the future.